In the last blog I bemoaned the fact that the tour of Palm Springs gardens didn't include cream teas - after of course, all that is very English! 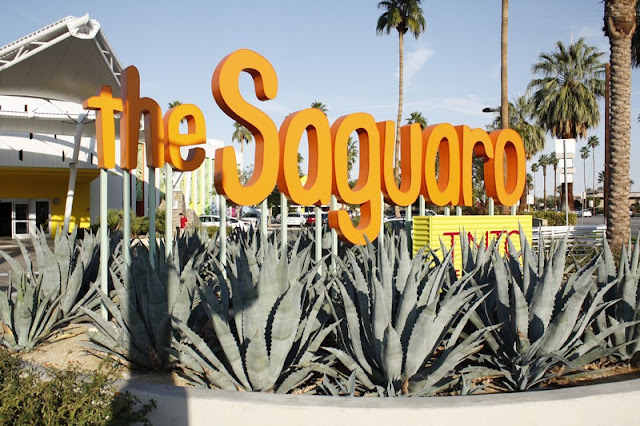 Well I have to be honest and say that there was a reception of sorts at the Saguaro Hotel at the end of the tour but as I'd already been garden visiting (and waiting in the streets for the gardens to open) for two and a half hours, I didn't stay for the wine and canapes. The word saguara refers to the dramatic wild west style cactus typically depicted in films. Its actually Carnegiea gigantea, a native of the Sonoran desert which also grows quite successfully here in Palm Springs. I do however feel that the architects or landscapers missed a trick when they planted the beds around the entrance and main sign. There's not a saguara cactus in sight but instead Agave and barrel cactus - woops! Not a cactus in sight! 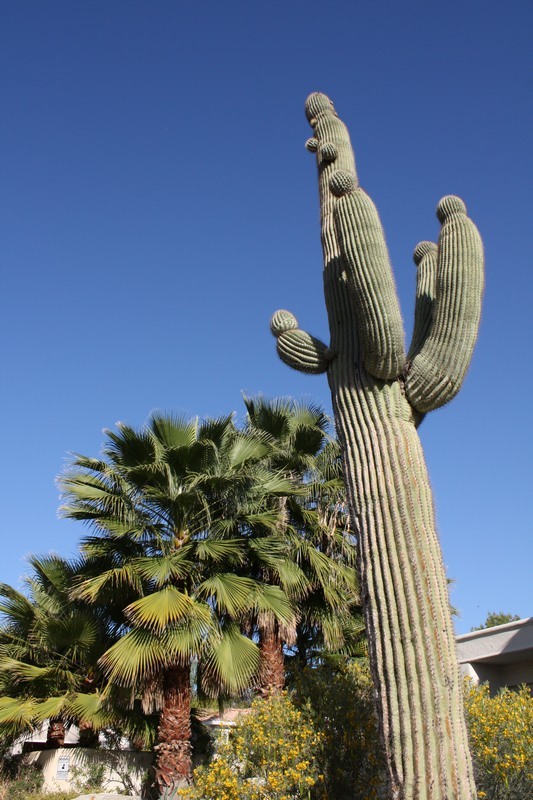 The saguaro growing locally - surely they could have found room for a couple of specimens! 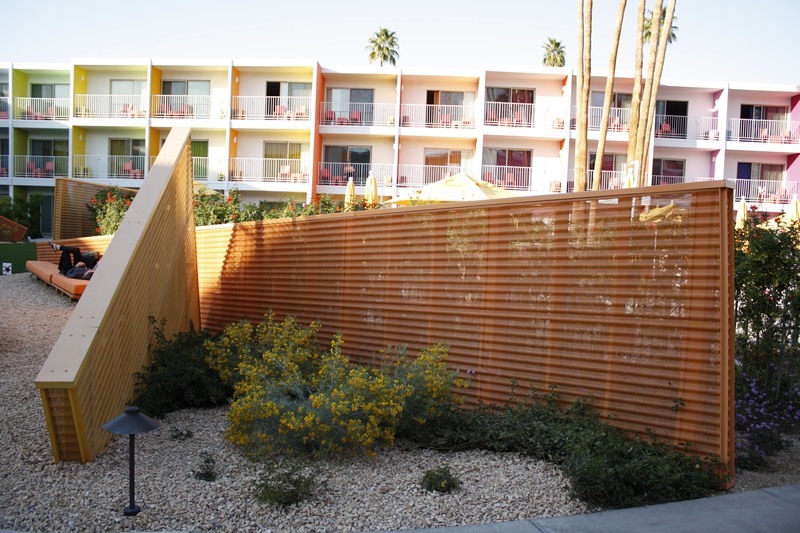 However I did want to see the gardens of the Saguaro Hotel so I dropped in for a quick look. Some of you might remember that last year I blogged on colour in architecture and referred to this hotel which had received a hotly contested rainbow makeover. 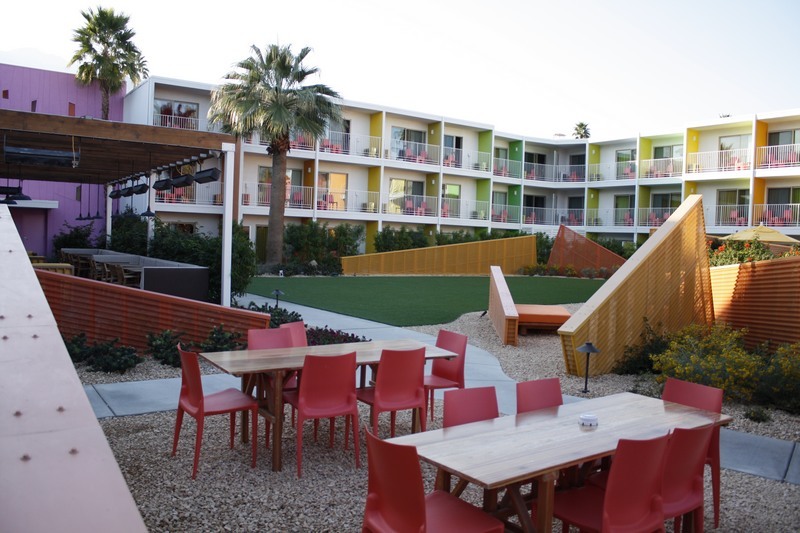 The end result is a quite remarkable renaissance of a traditional motel building. I've no idea of its hospitality, restaurants or amenities but as architecture, its now quite iconic and certainly colourful! You can't miss this landmark! The landscape in the central courtyard is striking with architectural elements meant to mimic the mountains dividing the area and also painted in bolds colours. 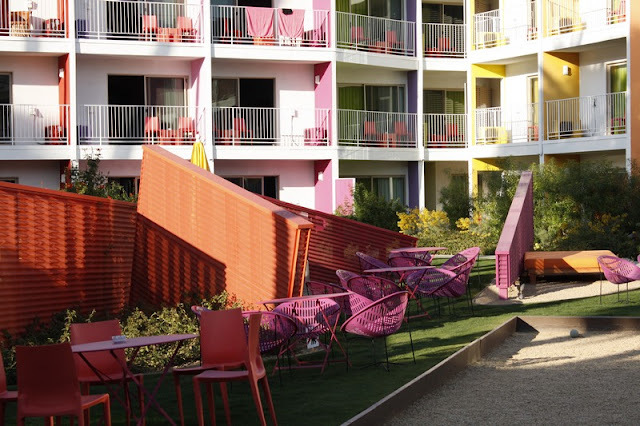 Whilst there are 14 colours in the palette for the building, just four colours were used for the planting which was not at its peak in February. I'm not sure how restful it is but it's certainly cheerful! 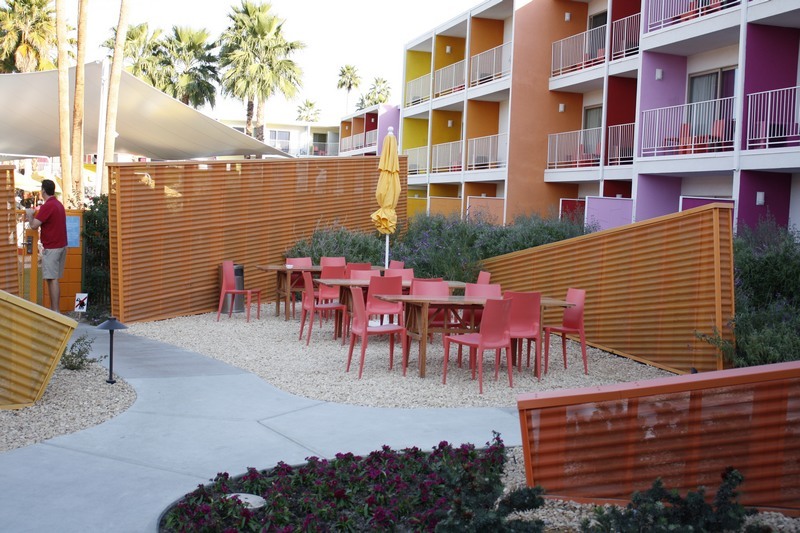 I think they've done a sterling job with the rainbow makeover, the motel looks so modern and fresh! Yes, it was a very controversial decision to add all the color and it caused quite some correspondence in the local newspaper. 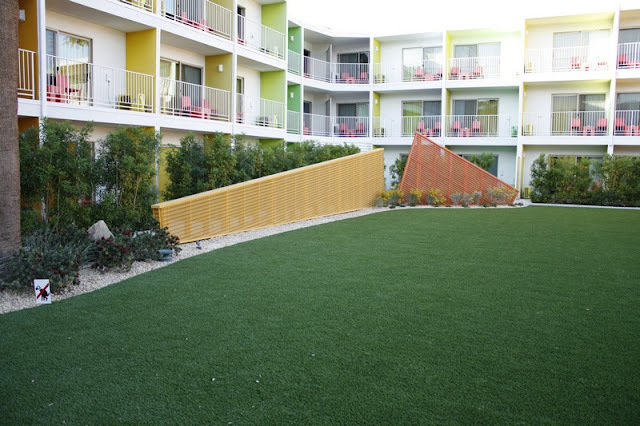 The motel was previously a pretty horrible dark green so it was quite a chance. A year or so on, the controversy is over and it's seen as one of THE places to see and be seen in Palm Springs. I really enjoyed it. I posted some pictures as well. It is very fresh and unexpected. Thanks for another great post of depth! The irony of a place name, without a plant of that namesake. Though perhaps there was a new saguaro in the past, but it was not irrigated or just never established? The way hardscape was used to mimic nearby terrain is also nice, and I see that on building facades out here. 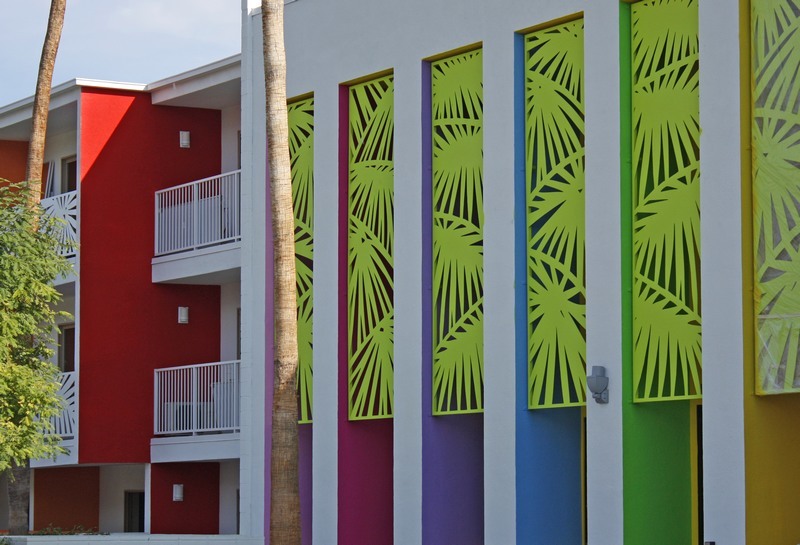 Too much color might reduce the relaxing feel of the hotel grounds, but then again, I wonder if dramatic mountains, hot sun, and blue skies do the same?. I was told by my Realtor how my purple wall out front and another bright wall inside should go, to increase mass appeal. My insight confirms his, unfortunately. But I and many others got 9 years of pleasure out of it! David - I so agree with you regarding colour - I love it! In my own tiny garden in the UK the rear wall is a hot paprika red and the back of the house orange - just reminds me of the sunshine colours in Palm Springs when I am away. I am a great advocate of paint - walls, features, seats,containers - be adventurous and then change the colours when you tire! Gardens open but not a Yellow Book in sight!